Includes everything you need to market your business with postcards: design, mailing list, printing, addressing, postage and delivery to post office. Fast Turnaround Times—Direct mail postcards are printed and mailed 5 to 6 business days after proof approval and list processing. With our expedite service they can be in the mail in as little as 3 days. One of the biggest keys to success, with direct mail marketing, is to have a design that not only looks good (professional and eye catching) but will also get people to respond. It does not matter how pretty and colorful your postcard design is—if it does not have the right design elements (attention grabbing headline, call to action, etc…) it is not going to pull a good response. We have years of experience when it comes to designing and creating postcards. We can guide you through the process and provide knowledgeable recommendations. Our talented full-service graphic design team can provide you with unique and fully-customized postcards—that will get great results. 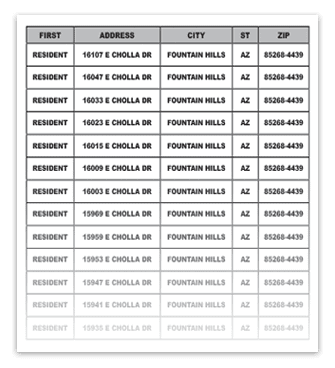 It’s simple—We know that providing our clients the most accurate and up-to-date direct mail lists available will result in the highest response rates possible. That’s why for our mailing lists we use high quality data from Axciom and Dun & Bradstreet. We offer a full range of direct mail lists allowing you to accurately target good prospects for your business. Our lists include consumer, business, occupant, new mover, new homeowners, pool owners, pet owners and more. Call us to learn more about our mailing lists and available demographic selections. Your postcards get mailed faster—no waiting for them to be shipped to you. You save money—no shipping costs to pay. You get lower postage rates—pay bulk mail postage rates. No need to store your extra postcards- when mailing regularly—we will warehouse them for FREE. In most cases you’ll save more on postage than the cost of our mailing services. On larger mailings you will save hundreds even thousands of dollars over doing it yourself!